Here’s a summer photo from Crystal Lake in Ironton Park above Ouray, Colorado on the Million Dollar Highway. The peaks in the background are the Red Mountains, looming above the historic mining district. Time to plan summer vacations. After having new shelves installed in my garage, I’m finally getting around to organizing, um, a lot of years worth of drawings, paintings, and other artworks. I’ve been posting them for sale on POD and original sites online and I need a record of what is available where, as well as the dimensions, creation year, and current asking price for each. I just installed the new Office, and was considering creating a database in Access, but I use Excel spreadsheets for my taxes, and that is probably easier. This blog post give the details. Uh, I signed up for too much. I am not sorry though. So far, I am more than half-way through the 20,000 words I had left to write on a draft of my novel, I have more than 100 ideas for picture books, and I have written 12 new contemporary free verse poems. As far as the Art a Day Challenge goes, I have gone out to shoot landscape photographs every day. It is a season of transition here in western Colorado. We have had the last of fall color, the first snow, some exciting wind that scoured out the haze, and a spectacular storm with billowing clouds. It would have been a sin to stay indoors, and I use photographs as sources for my other artwork. I sell some of my photographs on Royalty-Free stock sites including Shutterstock, IStock, Dreamstime, BigStock, Fotalia, Veer, Depositphotos, Canstock, 123 Royalty Free and more, but I do not count my straight digital captures as artwork. I will see if I can post some new art tomorrow. 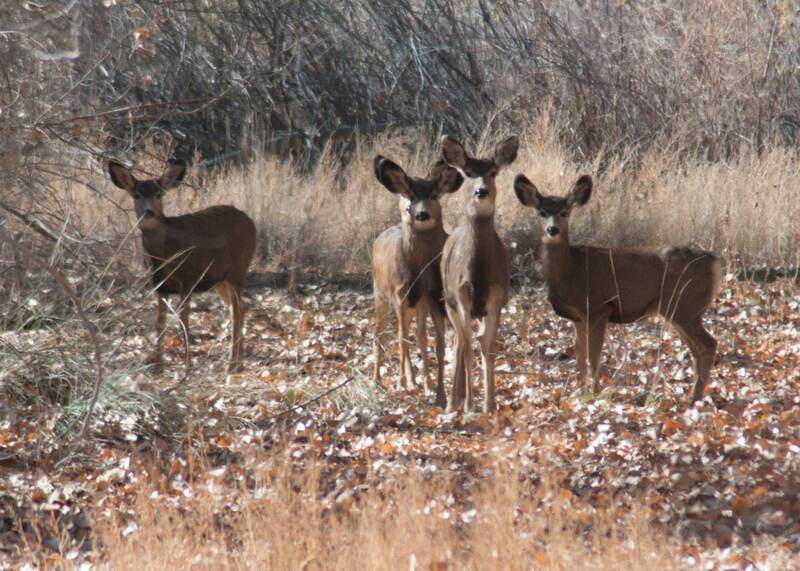 For now, here are some deer we spotted at the Grand Junction Wildlife Refuge near the Colorado River. They were watching us from a grove of cottonwoods. The image is cropped from a larger frame and is more than a bit soft, but I wanted to share them with you. If you are on the East Coast, follow the link below for some timely information regarding special assistance. Some Help for Artists, Galleries, Private Collections and Museums Impacted by Hurricane Sandy. For fellow artists seeking gallery representation, here’s a helpful post from a dealer. This post has been forwarded from my Posterous archive. As you will discover, if you follow this blog, I have too many interests and am easily led astray. I say this because, though I have enjoyed this break, I need to resume work on an exciting new writing project.